Malaysia’s highest court this week upheld a lower court’s lifting of a ban on two cartoon books by Zunar, Perak Darul Kartun and 1 Funny Malaysia. 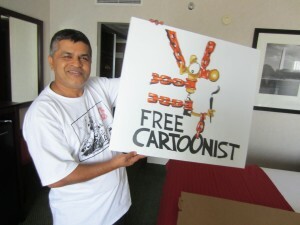 The five-judge panel of the Federal Court ruled that the Home Ministry had shown “insufficient evidence of public disorder” caused by the cartoons, and ordered the government to return 33 copies of the books seized from Zunar’s workplace. The ruling does not affect the nine charges of sedition against the cartoonist himself, which are currently on hold since he and two other defendants challenged the entire Sedition Act. Why do they do this? The pressure [is now on] the government, and I know I get good support from the international community, the United Nations… so the world is watching my trial. So that is why I want to go back. I want to expose this for my country, not for me alone, and the government will get an official trial. This is my responsibility. It is very effective, to laugh at them. And if more and more people take part and laugh at the government their ability goes. Because if people don’t respect you they laugh at you. And many people take part in this by sharing my cartoons. I don’t want to think so much about the outcome because I want to concentrate on drawing cartoons. If I think so much about that it will affect my output. I will start to practice censorship. So I don’t want to do that.